Welcome to the N5AU station tour. During the 1980's I was very fortunate to be allowed almost unlimited access to one of the biggest amateur radio stations in the world. I also got to operate with and learn from some great contest operators. This experience helped me become a better operator and taught me a vast amount about contest station design. N5AU is the callsign of Gordon Fogg. Gordon had always wanted to win the multi-multi category in the CQ World Wide SSB DX contest. In 1980 he set out to build a station that would be designed from the ground up with just this goal in mind. 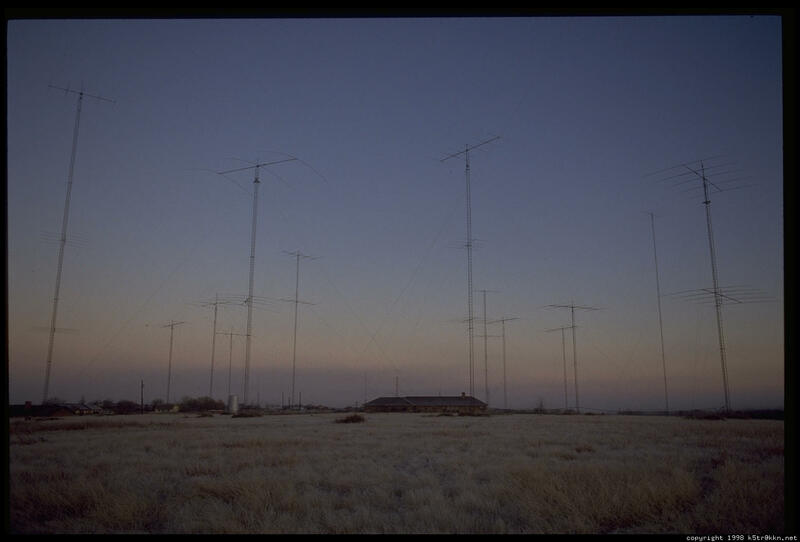 Over the years the antennas at N5AU changed and evolved in an effort to make the station louder and more flexible. The things that worked were kept - the things that did not work were changed. As I describe each band I will attempt to tell you some of the other antennas that had been up over the years on that band and what antennas worked or didn't work as the case may be. One thing worth pointing out is that the station was designed for M/M and certain things were done to that end - things that you would not need to do at a station designed for single op or multi-single. Sadly the station has been off the air since about 1993 - Gordon has had an incresing intrest in building a station in and operating from VP2EC. Over the years he has taken some of the hardware down to VP2EC - so when you hear him on the air from there with a big signal you will know why. I wanted to do this tour so that others could see one of the bigger stations ever built. 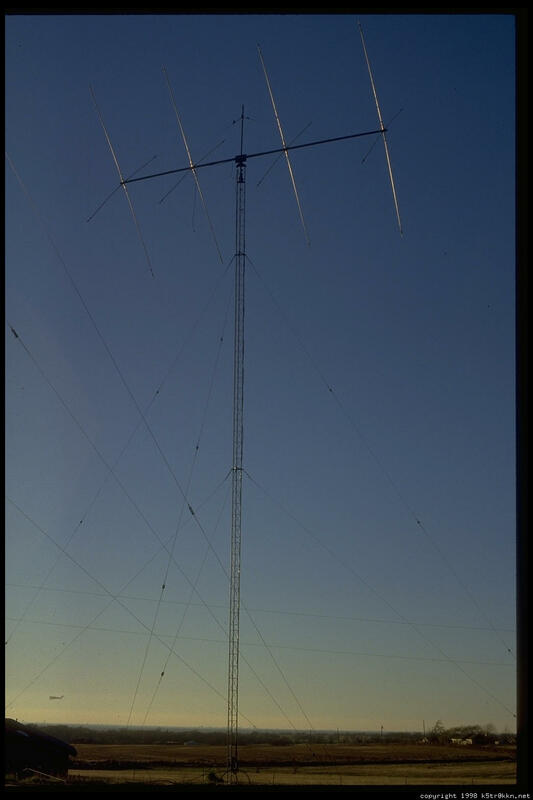 The main 10 meter antenna was a single 6 element Telrex on a 36 foot boom at 120 feet. This antenna worked very well for the low angle times on the band. This tower also supported the South American stack - a pair of 4 element Cushcraft yagis at 75 feet over 40 feet. This also shows one of the design "features" of the N5AU station was fixed antennas - as they did not involve rotators that can break and it is much faster to switch to an antenna then it is to wait for a beam to turn. It was very important that these fixed antennas work at least as well as the big yagis so that it was never necessary to turn one of the big antennas to work a station. We also two other rotary antennas on 10 meters one was a 6 element Telrex at 80 feet. 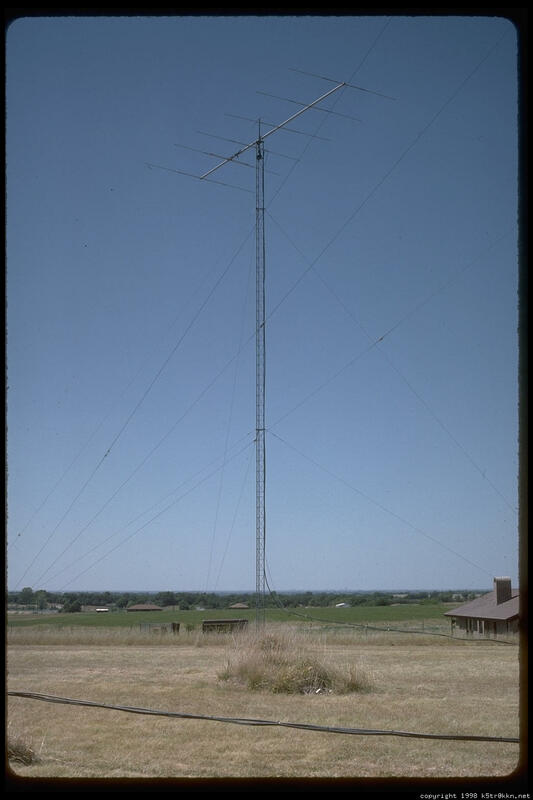 This antenna was used for the multiplier station during M/M efforts. The other rotary antenna on 10 meters as a 5 element Telrex at 50 feet (not pictured). 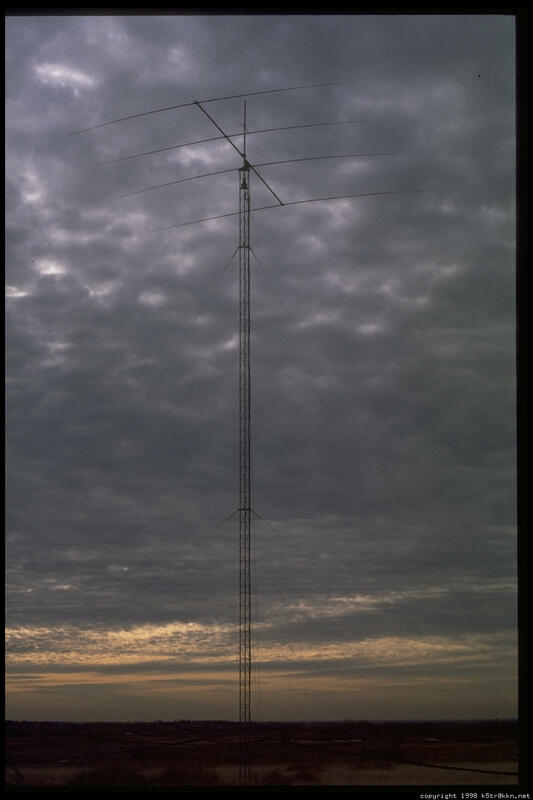 The European antenna was a pair of Cushcraft yagis at 80 feet over 50 feet - this antenna also worked quite well for E-skip into the northeastern U.S. We also had a 5 element Telrex 10 meter yagi at 50 feet that was on a rotator. 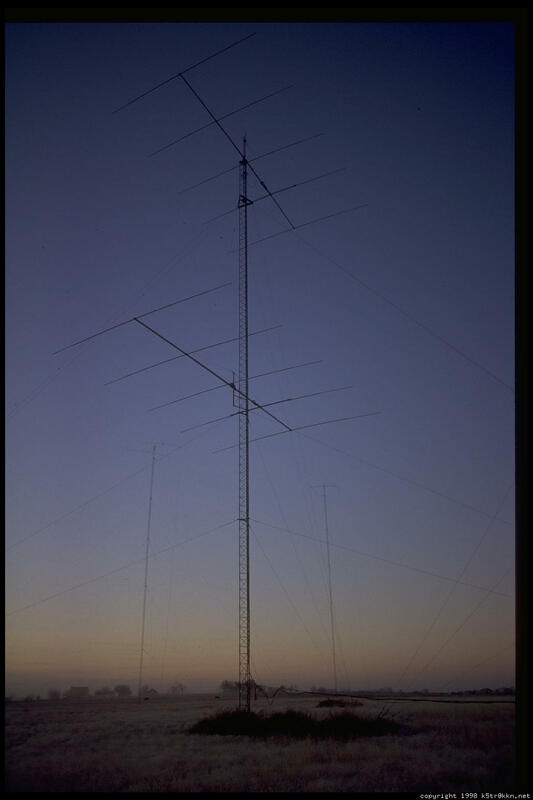 15 meters was Gordon's favorite band and it showed in the number of antennas. The big tall rotary antenna (left) was a 5 element Telrex yagi at 175 feet. This antenna was fantastic on long path and for working stations over the north pole. 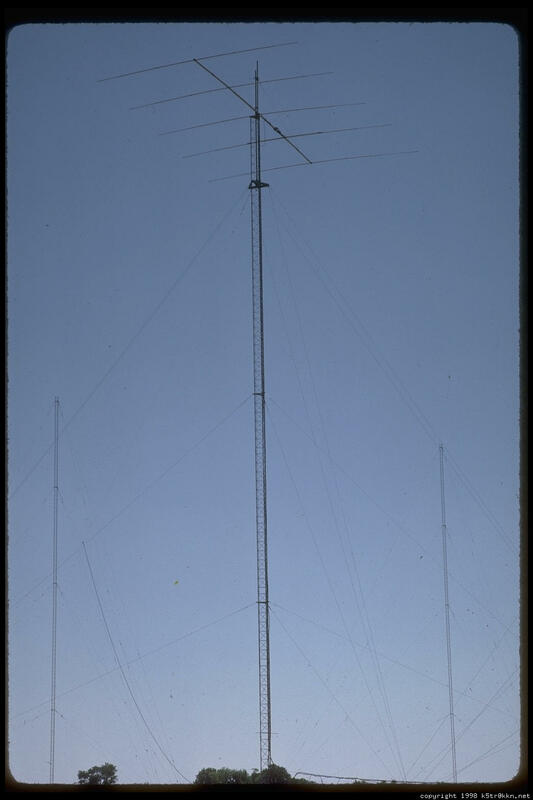 This tower also supported a pair of 4 element Cushcraft yaigs at 90 feet over 45 feet fixed on South America as well as a 4 element Cushcraft yagi at 120 feet (not on the the tower in this photograph) fixed on the South Pacific. The other rotary antenna (right) for 15 meters was a 5 element Telrex yagi at 60 feet. This antenna was used for the second station during the multi-multis and was by far the best antenna for Africa in the afternoon. 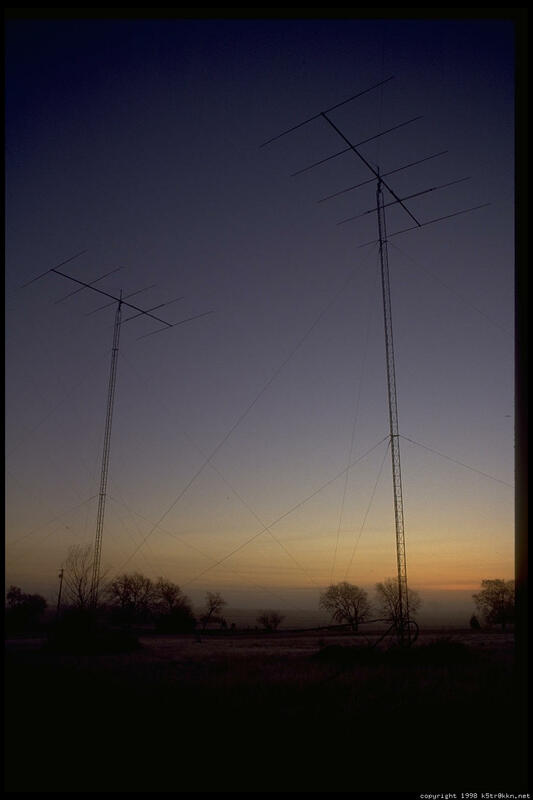 The European antenna was a pair of 5 element Telrex yagis at 135 feet over 90 feet. These antennas were feed in phase all the time and worked very well. There were times when we would be running Europe that other locals could not even hear. 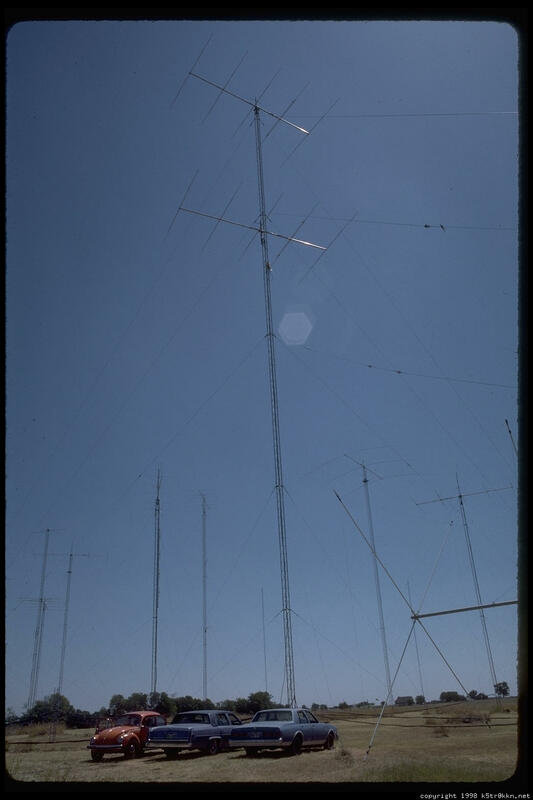 When we first put up a vertical stack fixed on Europe we put up three of these antennas. They were at 135'/90'/45' after using them for a few contests we decided that the upper pair was usually the best antenna and was never worse than the lower pair. We could only run two antennas at a time. The yagi that was the 45 foot high one in the stack was put at 175'. 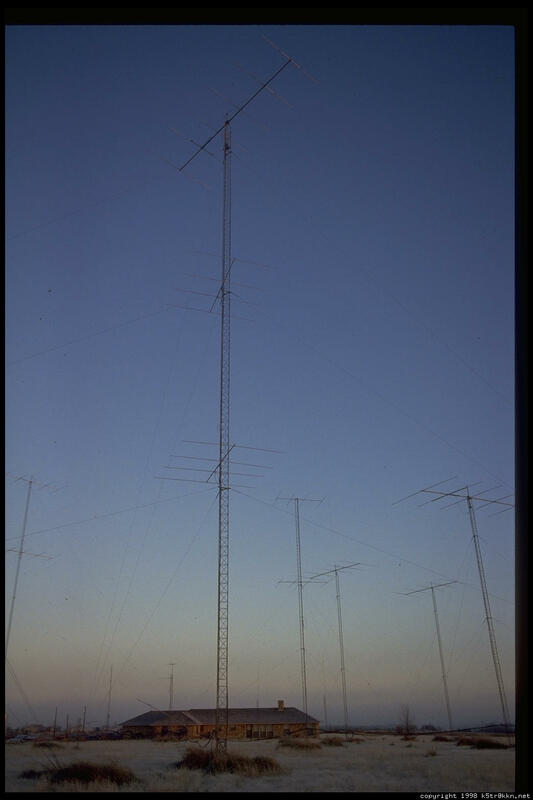 The JA antenna was a pair of 5 element Telrex yagis side by side on two towers 70 feet high and 70 feet apart. From Texas Japan is a very important source of QSOs during a DX contest and this antenna was one of the better antennas on any band at the station. It had a very narrow beam width and was the best antenna for JA anytime the band was open - the only time the high antenna was better was for about 5 minutes at the beginning and end of the opening. The big, tall antenna on 20 meters was a 5 element Telrex 46' boom yagi at 200 feet. (pictured on the ground) This was dubbed the "Siberian Express" - it was the best antenna over the pole. It also was by far the best antenna on the long path. 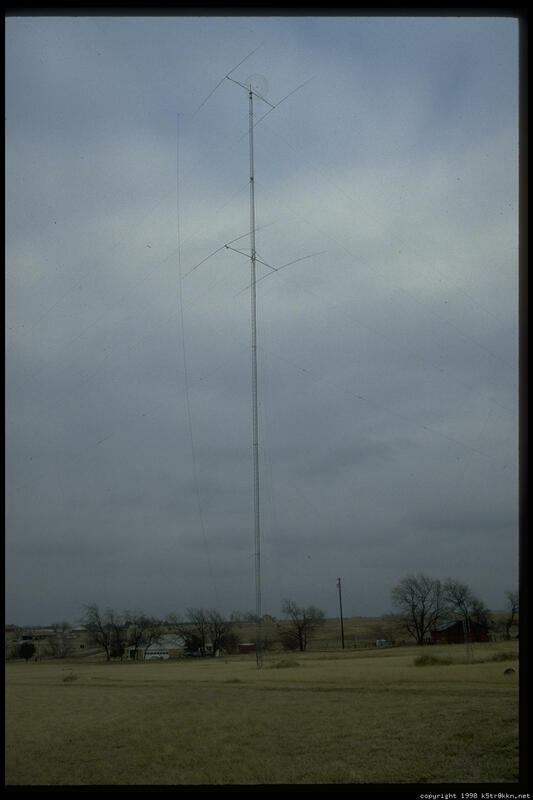 This antenna was also often the BEST antenna for the west during sweepstakes - and I would often switch between it and the 100' high antenna as the west choice on the switch during Sweepstakes. This was one of the last additions made to the N5AU station. 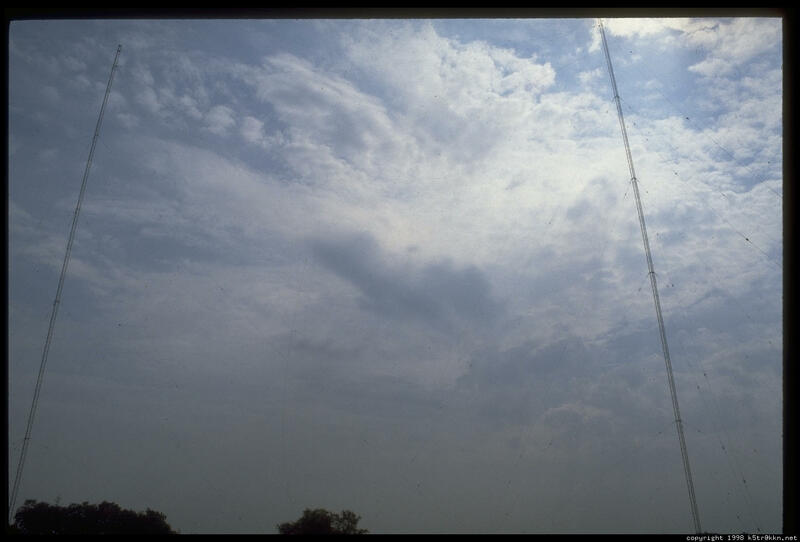 This 200 foot tower also supported a pair of Hy-Gain 204BA yagis at 140 feet over 70 feet fixed on Europe. It was only an ok performer, often the 100' high 5 element was a better antenna for Europe. We added a lower antenna at 50' fixed on Europe. 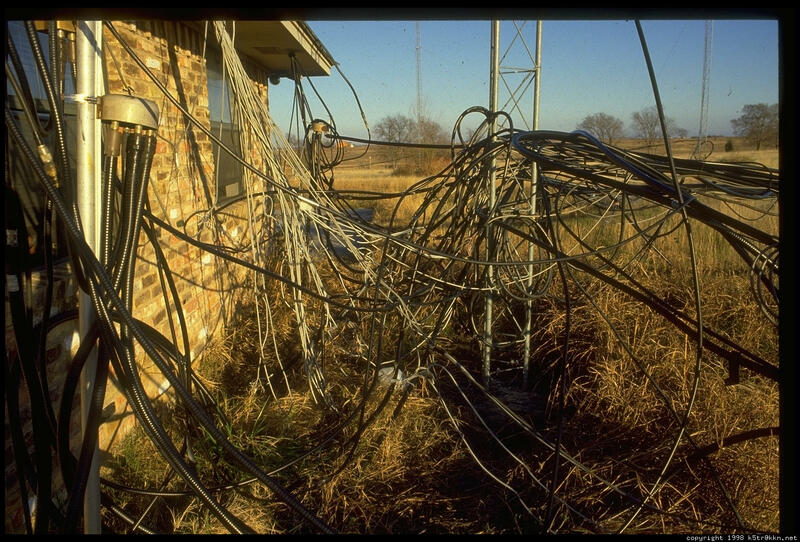 This was a great European antenna but after sidemount broke, leaving the antenna hanging by the feedline and resting on a guy wire we never put it back up. 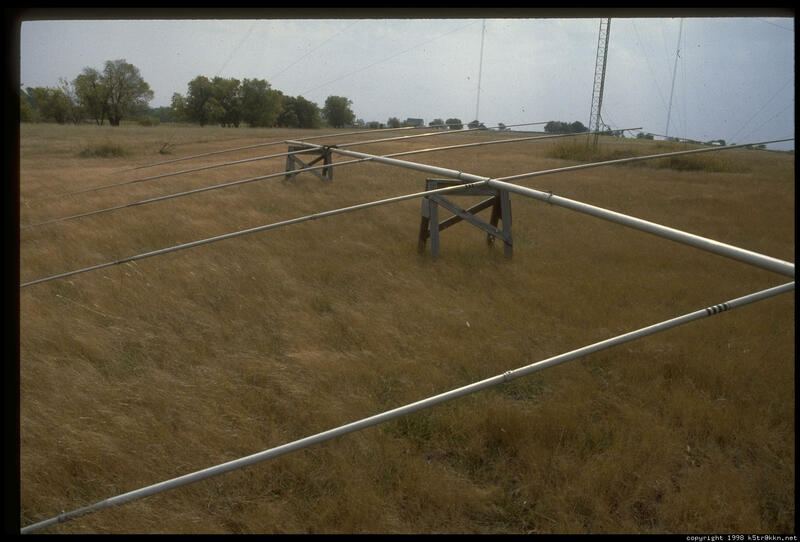 This antenna later became the 200 foot high yagi. 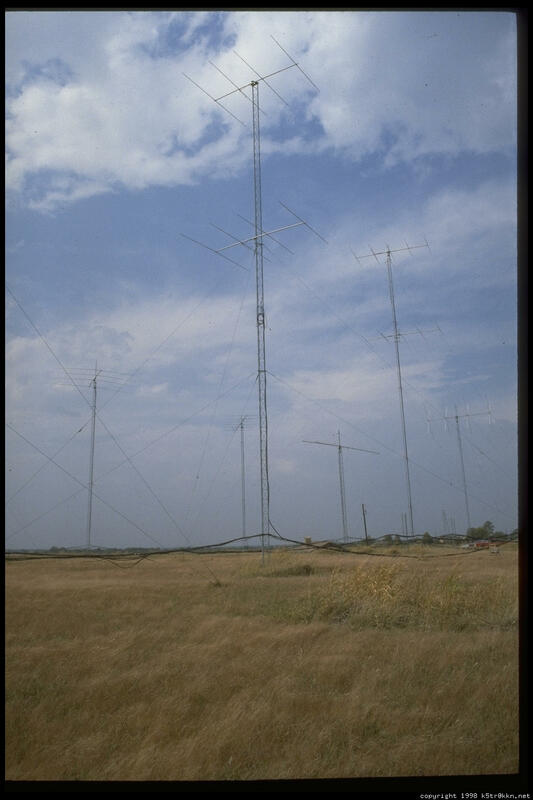 This stack was up in 1986 when we won the CQ WW SSB contest. 4 element QUAD on a 36' boom at 80' This was a great antenna. During the day it was sometimes a better antenna for europe than the 100' 5 element. It was always the best antenna for working the United States. We used this antenna as the northeast antenna in the Sweepstakes. Hygain 204BA at 70' Good antenna - it did not have the gain of the bigger antennas but it was used mainly as a fill antenna. It was also sometime used as the "west" antenna in the sweepstakes. 40 meters was a band that we did very well on from N5AU but in contrast to the higher bands it has few antennas. The Primary antenna for 40 meters was a 3 element Telrex yagi on a 48 foot boom at 120 feet. 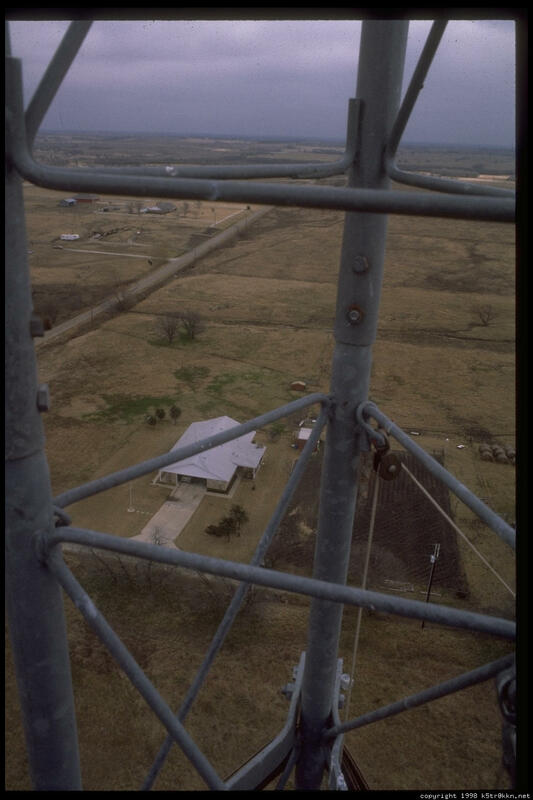 This antenna was put up in 1980 when the station and never needed any repairs. The Tower was Rohn 45G and was double guyed at the top guy point. The rotator was a big Telrex and always turned this antenna with ease. Here are two diffrent views of this antenna. In the photo to the right you can see a 4 element 20 meter yagi that is fixed towards South America. 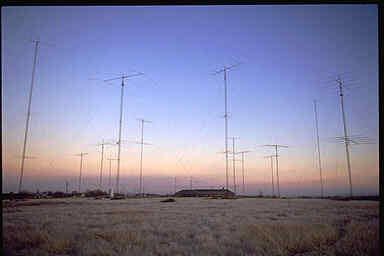 The other 40 meter antenna was a stack of 2 element Cushcraft yagis at 190 feet over 120 feet. The top antenna rotates and the lower one was fixed on Japan with upper / lower / both switching. We found that two of the Cushcrafts would just about equal the 3 ele fullsixed yagi. This tower also supported the three 160 meter sloping dioples. 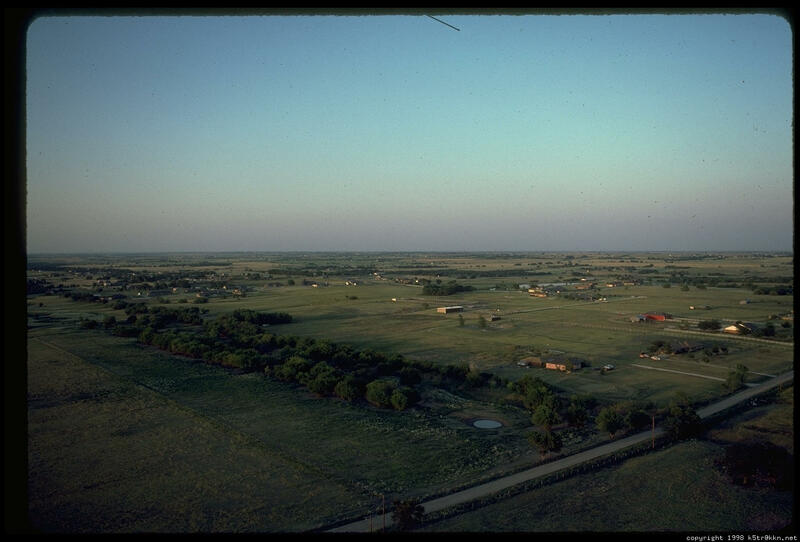 You can see one of the dipole feedlines in this photograph. If you have ever wanted to know what it was like to look down on 100 plus foot towers, here is a veiw from the top of this 190 foot tower. 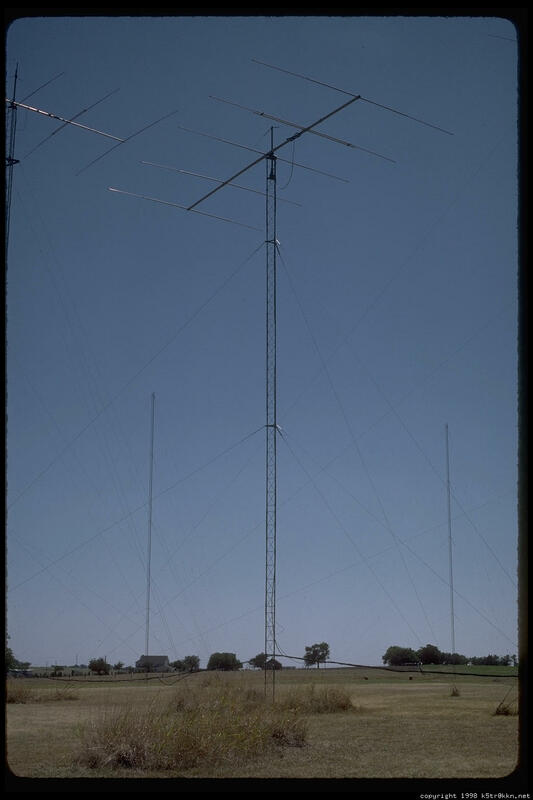 In this photograph you are looking to the southwest and the 3 element fullsized 40 meter yagi is in the middle of the photograph. It is kind of hard to see as it has the pond behind it. The 80 meter antennas were mainly made of wire and wire is very hard to photograph. 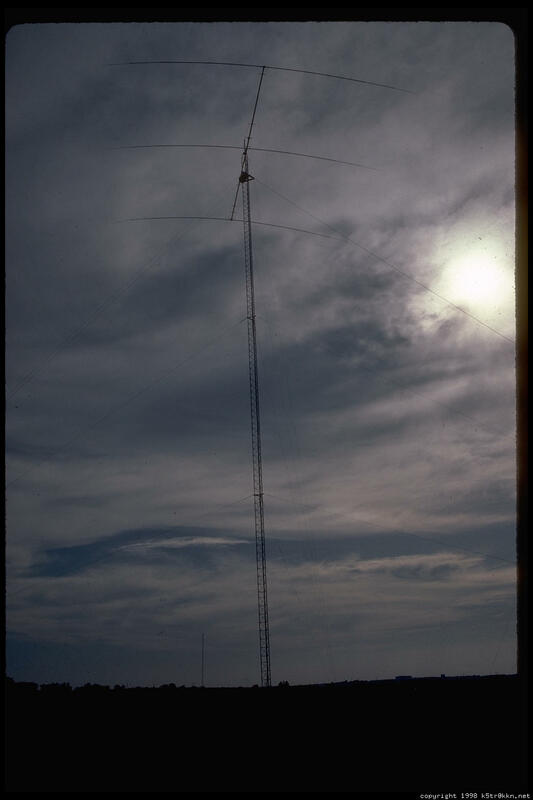 The biggest of the 80 meter antennas was a 3 element delat loop on a 100 foot boom. It was suspended between two 170 foot towers. 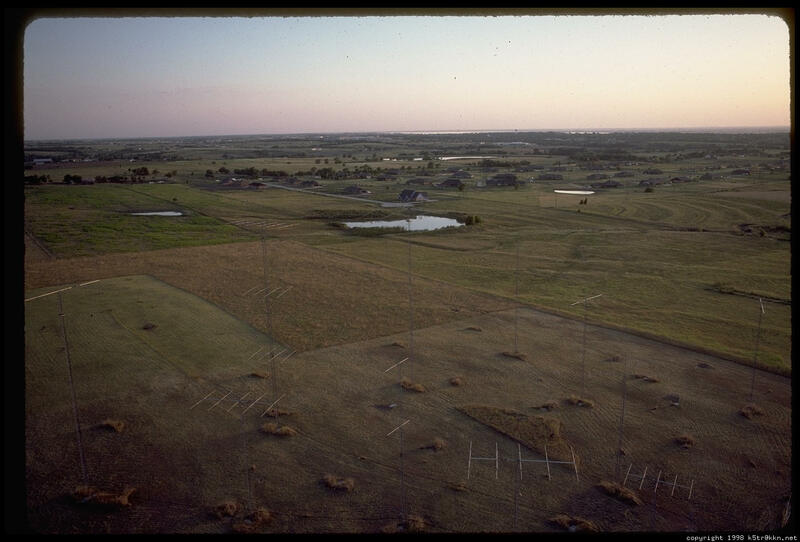 The tops of the loops were at about 160 feet and the bottoms were around 90 feet. It was pointed at Europe and was always at least 10db better than a diople at the same height. It was also a very quiet antenna. You can just barely make out some of the loops in this photograph. 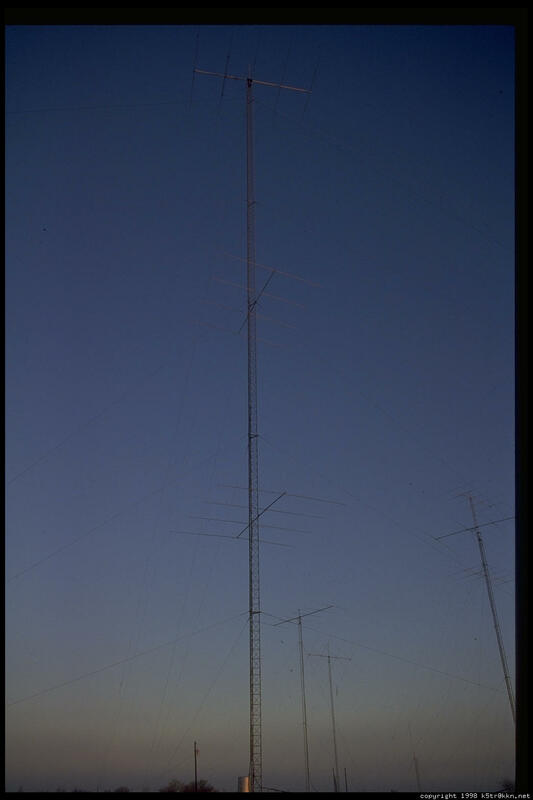 Other 80 meter antennas were a diople at 180 feet broadside east/west, A diople at about 130 feet broadside norhteast/southwest, A dipole at 140 feet broadside north/south and a bobtail curtian broadside northwest/southeast. The 160 meter antennas have the same problem as on 80 meters, wires just don't make good photographic subjects. On 160 meters we had 3 half-wave slopping dipoles on the 190 foot tower. The guy wires were not broken up and the dipoles bisected the guy angles. We had antennas northeast, southeast and west. This antenna worked very well and I think it was the single most impressive antenna on ANY band at the station. If you would like to hear how it sounded you can listen to a recording I made when I was at HR6A. Having all of these antennas means that you need alot of hardline and control/rotator cables. All of the antennas were feed with either 1/2 inch or 7/8 inch hardline. Some of the feeline runs were in the 400 to 600 foot range. Even though this looks like a real mess I got to the point that I knew what and where most of it was. Go inside and take a look around. Take a look around from the top of the 190 foot tower.